A couple of years ago, Matt Loomis and I met at a convention, tentatively showed our games to one another, and decided to work together as co-designers. Unlike some design duos, Matt and I share all of our games. We have a Slack channel where we write down all of our ideas for themes, mechanisms and games, and over time, we pass ideas back and forth, with each of us adding new layers and ideas to the games as they take shape. Also unlike some design duos, Matt and I live a thousand miles away from one another, and so much of our collaboration happens online and on the phone. “Um, ok. Sell it to me.” I prepared to not listen and to argue. “Abstract tile laying? It’ll have to be about zombies or Cthulhu or something if we want it to sell. We’ll need a really catchy name too.” I love abstract games, but they’re hard to sell. Ok, that part didn’t happen, since we were talking, and he didn’t say ‘axes’ he said ‘ax-ees’. Still, my confusion was real. “How do you play this thing?” I asked. 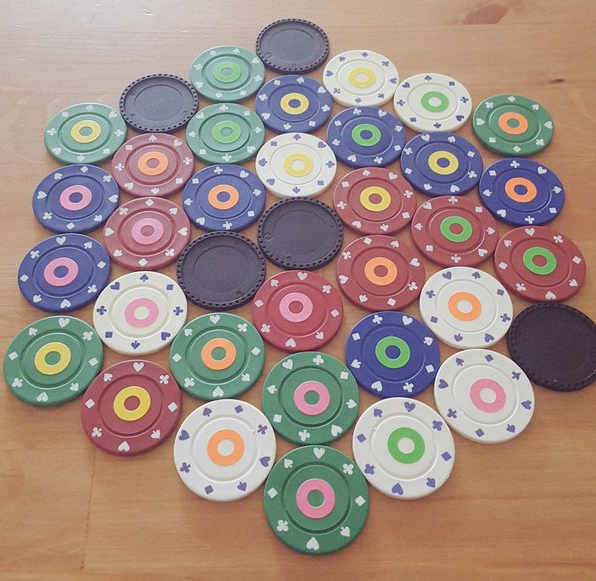 “Ok, I think I get the birds, sort of reminds me of Knizia’s Ingenious. Can you go over the flowers bit, and how you score from different perspectives?” I don’t think I managed to keep the skepticism out of my voice. I was intrigued, on the one hand, but I was also not very enthusiastic. The game’s description didn’t leap out at me, and we have so many promising prototypes that I really didn’t want to spend time on another game and dilute our efforts. But I know Matt loves tile-laying, set-collection and spatial-relationship games, and this seemed like it was some combination of all of those. And I love hexagonal board games like Abalone, Blokus Trigon, or even the old Milton Bradley game, Knock Out. 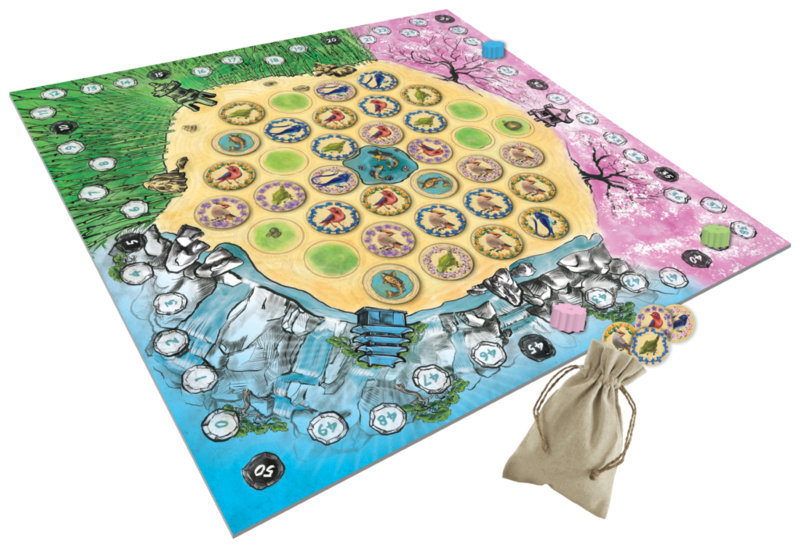 After my first game of Seikatsu, I was sold. We still had to work out some of the scoring, and we had many conversations and experiments around the core ideas. Maybe birds could move? Maybe we could do something with grass and water at the intersections of the tiles? What should the Koi tile do? What about other tiles, like statues, lotus flowers, or river stones? Some of those ideas made it into testing, and some might eventually become promos or expansions in the future. But the core of the game, the game that we eventually showed to Nate Murray at IDW, was remarkably similar to the one that Matt hatched on a Friday night, prototyped on a Saturday, and shared with me by phone on a cold Sunday in February. A week or so later, Matt came to my house for the weekend and we worked on Seikatsu, and all of our other games. At the end, I drove Matt to the airport, and I went right home and produced my own prototype right away, because I all I wanted to do was play Seikastu again. Since that time, we’ve gone through hundreds of playtests at conventions and meetups, and even online, using Tabletop Simulator. 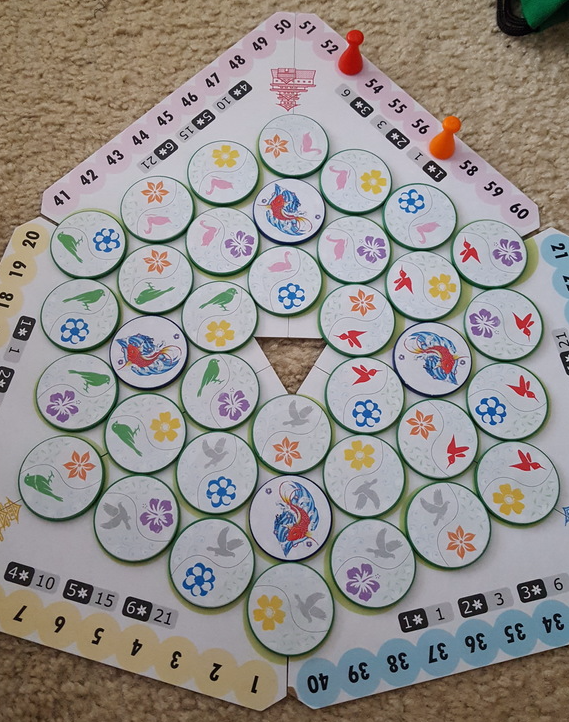 We figured out how to make the Koi tiles work as wild fish first, and wild flowers later, we sorted out how to score the birds and flowers so you couldn’t ignore either one when planning your moves, and we figured out how to use the bag-drawing mechanism to help remind players of their turns. Somehow we found a way to make the game feel Zen, but also feel competitive. We invented a solo version of the game, a partnership mode, and even a mind-bendingly ridiculous 4-player version that we may one day share with players. 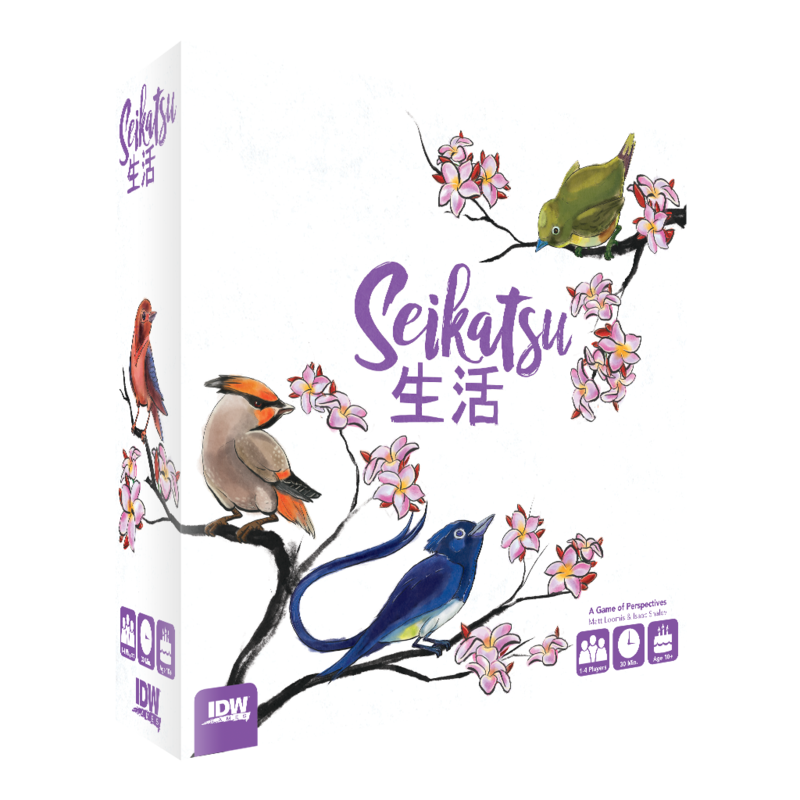 Seikatsu was one of those games that just worked right and felt right immediately. The original game concept and mechanics were so solid from the start, and the effect on players was clear right away. We knew we had a winner on our hands, and we did everything we could to focus the game on the best parts of it. We’ve been enormously lucky to work with IDW, who believe in this game so much. From the incredible art and art direction to the heavy tiles and beautiful box, IDW has shown as much love and care for the game as me and Matt have. We’re really excited for the release, and we hope you’ll enjoy the Zen competition of different perspectives that Seikatsu is all about. ← Rayguns and Rocketships in its FINAL 48 HOURS!